In 1747 Horace Walpole leased then purchased a late C17th house in Twickenham and between 1749 and 1776 he created Strawberry Hill, extending the house into what has been called a cross between a medieval castle and an abbey. He purchased further land over the years, including meadows to the east and south, and his grounds eventually ran down to the river. Although land has been lost to housing and the view lost to woodland the grassed areas and the layout of his tree planting survive. Has taken part in Open Garden Squares Weekend 2 times, most recently in 2018. Rail/Tube (District): Richmond then bus. Rail: Strawberry Hill. Bus: R68, 33. In 1747 Horace Walpole (1717-1797) purchased the lease of Chopp'd Straw Hall, a late C17th house in Twickenham with c.2 hectares of land, buying the freehold and a further 2 hectares in 1748. Walpole was the youngest son of Prime Minister Sir Robert Walpole and was by then an MP and well-known 'man of letters', chronicler of public events, author and essayist, as well as an expert on history, painting and gardens and a notable collector and antiquary. By then Twickenham was already fashionable with numerous artists and writers living in the vicinity, although Alexander Pope, who had lived at Cross Deep nearby, had died in 1744. Between 1749 and 1776 Walpole converted and extended the old house into 'the first significant house of the Gothic Revival' (Iddon), a cross between a medieval castle and an abbey, that he called Strawberry Hill. Designers of the interiors included John Chute and Robert Adam, and an office wing added to the south-west in 1790 was designed by James Essex. Walpole purchased further land over the years, including meadows to the east and south, and the grounds eventually covered 18 hectares and ran down to the river. Like Alexander Pope, Walpole's work in the grounds was the antithesis of the traditional classical and symmetrical English gardens; he planted numerous trees as well as lilacs, jonquils, acacias, syringas, and established two cascades. He gradually inserted architectural features into his landscape such as a Chinese bridge, shell bench, chapel in the woods and rustic cottage. The terrace walk commenced in 1750 had a fine view of the river from the brow of a natural hill; this led to a serpentine 'sweet walk' shown on the 1791 plan of the estate. A wooded walk was formed from the boundary hedge that he purchased from his neighbour, nurseryman Mr Ashe in 1752. The shell bench and gothic gate along the walk later disappeared, but the shell bench has been recreated in the recent restoration. In 1753 Walpole described his view as 'an open grove through which you can see a field which is bounded by a serpentine wood of all kinds of trees and flowering shrubs and flowers. The lawn before the house is situated on the top of a small hill from where to the left you see the town and church of Twickenham'. The wooded walk led to the Chapel, which was designed for Walpole by John Chute in 1772 and built in 1774 by Thomas Gayfere, the master mason of Westminster Abbey. This originally contained an oak bench and head of St John the Baptist by Donatello, but later replaced by a sculpture, 'Our Lady of Strawberry Hill' commissioned after WWII. The trees around the chapel were later replanted. In 1791 the serpentine walk continued west past the Chapel to the service area of Walpole's house, which later became car parks and college buildings. A gothic gate led from the serpentine walk to the meadows on the banks of the Thames to the south east, and an obelisk was set up as an eye catcher at the junction of what was then Hampton Court Road, now Waldegrave Road, and Cross Deep on the edge of the meadows to the north east. The meadows to the east were developed for college residents in the 1930s although some playing fields survive as open land. Walpole's niece, sculptress Anne Seymour Damer, inherited the estate on his death in 1797 but finding it too costly to run she let it in 1810 to the Waldegrave family. The house was empty in 1835 and Walpole's collection of art, books and curios fetched over £33,450 at a celebrated auction in 1842. In 1848 Lady Frances Waldegrave, grand-daughter of Walpole's brother Edward and the widow of the 7th Earl Waldegrave, remarried George Granville Harcourt and in 1856 she began to restore and expand the now derelict house and its grounds, adding a wing between Walpole's house and office wing in 1856-73. By her death in 1879 Strawberry Hill was again one of the most famous houses in London. In 1923 the Catholic Education Council purchased the estate and opened St Mary's Teacher Training College, later St Mary's University College, and built a chapel, lecture room and dormitory blocks in the grounds. Badly bombed in WWII, the house and grounds were renovated by the architect Sir Albert Richardson (President of the Royal Academy 1954-56) at which time Walpole's Chapel in the Woods became separated from the gardens. Playing fields and halls of residence were constructed on the southern boundary. 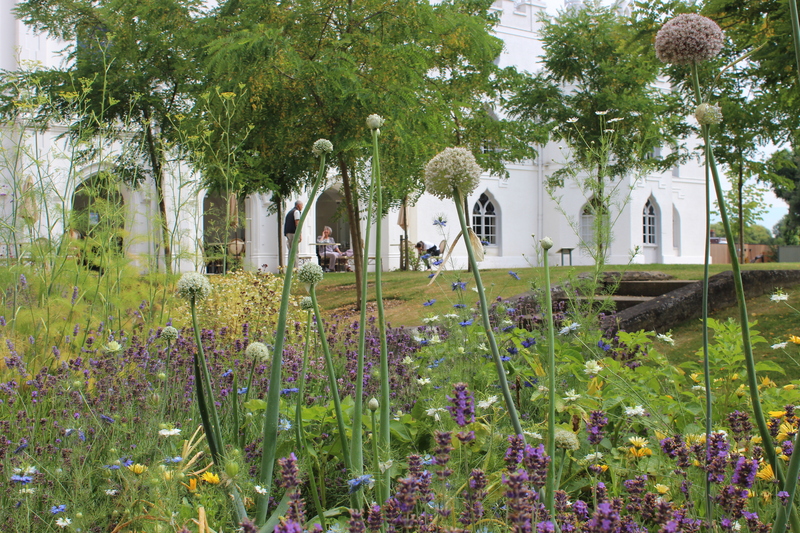 In August 2002 The Strawberry Hill Trust was formed to restore Walpole’s villa and open it to a wider public, and took a 120 year lease from the Catholic Education Service. The Trust secured £8.9 million in funding largely through an HLF grant to restore the house and garden, Restoration of Strawberry Hill was completed in 2011. In addition to major works to restore the house to what it was at the time of Walpole's death in 1790, the gardens are also being restored as far as possible to the original C18th design, and the Open Grove of lime trees is the process of being replanted. Strawberry Hill Trust also instigated a 3 year apprenticeship scheme, with funding from HLF and the Hampton Fuel Allotment Charity, whereby each year one apprentice is employed to assist the gardener in charge in the restoration of the C18th gardens and to manage the community garden, working towards the nationally-recognized Diploma: Horticulture Level 2, Parks, Gardens and Green Spaces. EH Register: 'Blest Retreats', London Borough of Richmond, 1984; Bridget Cherry & Nikolaus Pevsner, The Buildings of England: London 2: South (Penguin) 1999; M Batey, H Buttery, D Lambert, K Wilkie 'Arcadian Thames, the River Landscape from Hampton to Kew' 1995; Anna Chalcraft 'A Paper House', 1998; Architectural Review September 1957 pp157-159. John Iddon 'Horace Walpole's Strawberry Hill: A History and Guide from Walpole's Time to the Present', St Mary's University College 1996.